Have you ever gone to an Arizona auto shop for a relatively inexpensive maintenance job only to have the mechanic tell you that you need a new water pump and your head gasket is leaking? Suddenly you need some major car repairs. While most mechanics in Tempe are hardworking and honest, some will try to make more profit by performing unnecessary car repairs. Since many car owners really don’t know when they are being sold a bill of goods, it’s buyer beware. Dishonest mechanics count on the fact that their customers don’t know anything about their vehicles, so they can tell them anything they want. Many of these unscrupulous practices are the same from one mechanic to the next, so here are some things to watch out for. Whenever you see an Arizona auto shop offer anything free, such as free tire rotation, or a free vehicle inspection, chances are they want to get you in the door so the mechanic can recommend numerous car repairs. The same is true when they advertise inexpensive services like a low cost oil change. They won’t make any money off the cheap oil change, but once again, their goal is to sell you more car repair and services, many of which may not even be necessary. To err is human, but it’s not okay if the car repair shop charges you for their error. If your Arizona mechanic tells you what they think the problem is, repairs it and then finds that wasn’t the problem after all, don’t allow him to continue changing parts, all the while charging you. This is a good way to run up a huge bill and still be left with a car that doesn’t run properly. Should this happen to you, find another Arizona auto shop with properly trained technicians and up to date diagnostic equipment. You should only pay for one car repair, if the mechanic doesn’t get it right the first time you shouldn’t have to pay him to try again. If this is the first time you are having your car’s brakes serviced in Tempe, you may not need new rotors. On most cars you can see your rotors right through the hubcap. Rub your finger over it; if you don’t feel any deep grooves they should be able to merely turn the rotors. They do this by putting them on a lathe and removing a layer of metal to make them smooth again. This can save you a lot of money since rotors are expensive. It depends on the make and model of your vehicle, since the price of rotors can vary greatly from one vehicle to another. Years ago, older engines burned fuel inefficiently causing the spark plugs to become fouled up with a buildup of carbon. In those days spark plugs needed to be changed yearly. That is no longer the case with today’s modern engines. They burn fuel so efficiently that it would be rare for a vehicle with less than 100,000 miles to need new spark plugs. If it does, there is an underlying problem, possibly with your mechanic. Many mechanics also consider themselves salesmen. Some of them will go as far as to attempt to frighten you into allowing them to perform repair work. They will tell you that your vehicle is unsafe to drive. If this is not a mechanic you know and trust, or if you have any doubts whatsoever, seek out a second opinion. Don’t fall prey to high pressure tactics. 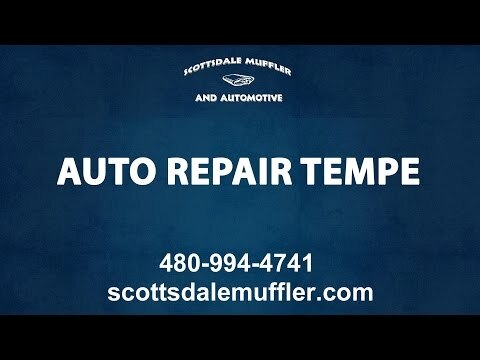 At Scottsdale Muffler & Automotive we have spent over 20 years building a reputation of honesty and excellence. Our reputation speaks for itself, as most of our regular customers have become our good friends. We are family owned and operated, with long standing ties to the community. We offer a wide range of expert car repair services in Tempe using highly trained technicians and employing the latest diagnostic equipment in order to get the job done right the first time. We want you to think of us as the car repair shop you can trust.